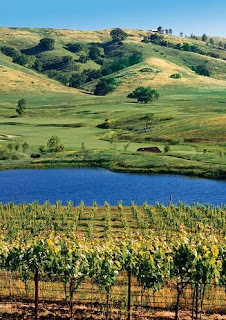 Stanford finishes tied for 3rd against one of the strongest fields in college golf in the Isleworth Collegiate, played at the home of Tiger Woods and many other PGA professionals, held Oct 24-26 in Windermere, Florida. One of the highlights of this trip was once again enjoying the hospitality and time with Tiger Woods --- on his blog after the event Tiger shared "I recently hosted the Stanford men's golf team for a barbecue at my house. 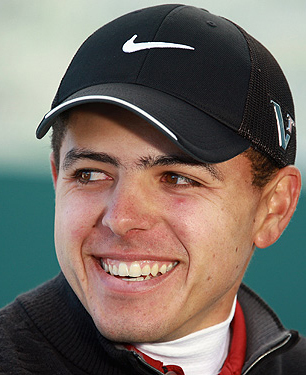 They were in town to play in the Isleworth Invitational, and it's become an annual event. It's great to have the guys around and let them basically ask questions. It's a lot of fun from both sides." See details below in the Round 3 Summary. Stanford sent a team with freshmen Cameron Wilson and Shane Lebow, sophomore Andrew Yun and two seniors Steve Ziegler and Sihwan Kim. 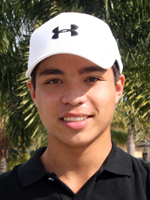 #1 player David Chung is off to Buenos Aires for the World Amateur and unavailable this week. This excellent tournament website tracks the tournament well. Real-time scoring by GolfStat was available as well. 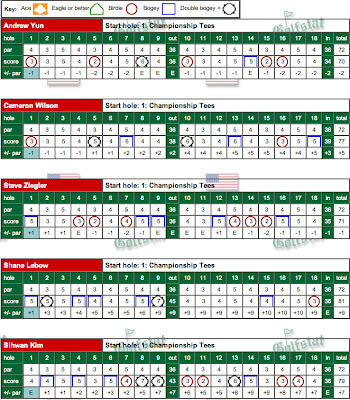 ROUND 2 SUMMARY - Stanford moved back to a tie for 2nd after two rounds, 4 strokes behind Alabama. Playing in windy conditions, the Cardinal was led by Andrew Yun who's in 2nd individually with rounds of 71-70. 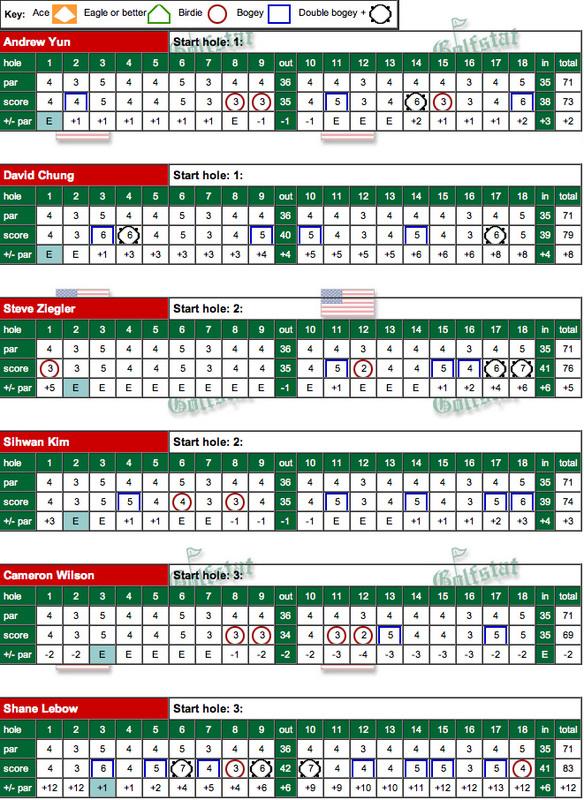 Ziegler fired a 1-under 71 (75-71), Wilson a 77 (73-77), Kim a 79 (71-79) and Lebow again had an 81 (81-81). 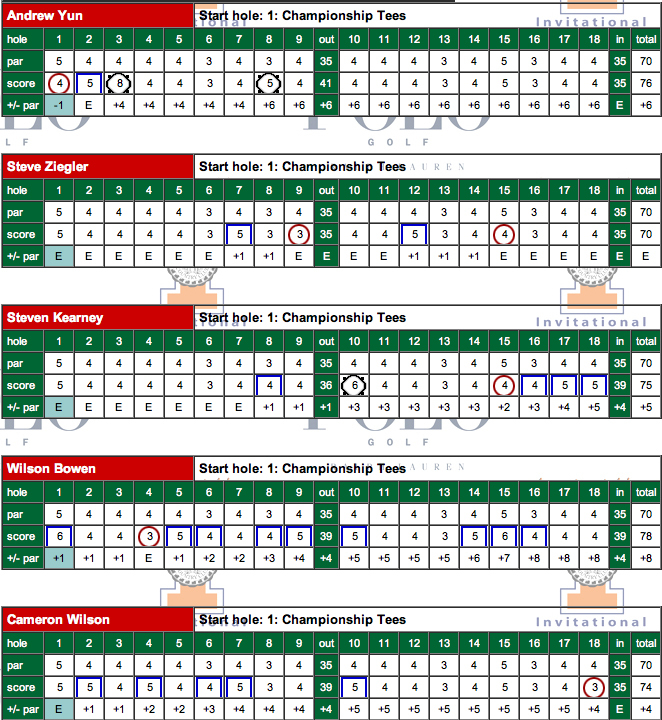 Second round scorecards are below - click on the image to enlarge. 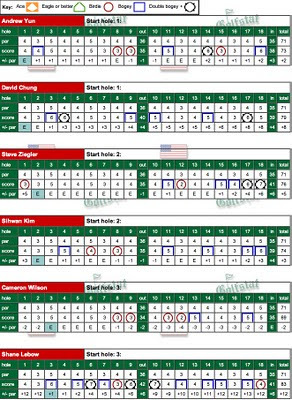 ROUND 3 SUMMARY - Playing in high winds with scores higher for almost everyone in the field, Stanford finished with a 3rd day total of 307, ending up 10 strokes behind the winner, Alabama. 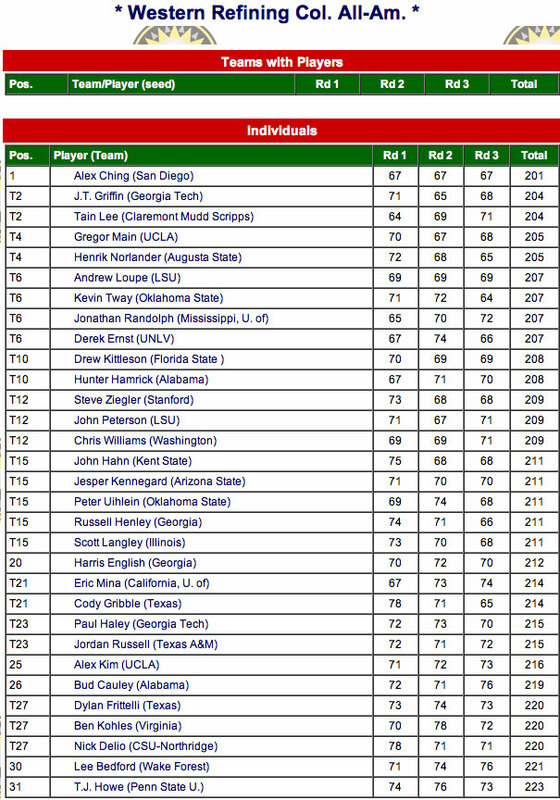 Stanford was led once again by Andrew Yun who finished 4th individually for another fine tournament after rounds of 71-70-76. 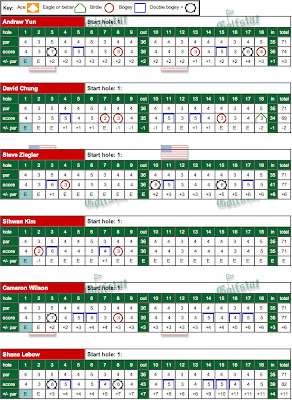 Ziegler had rounds of 75-71-76 (T14), Wilson shot 73-77-76 (T26), Kim shot 71-79-79 (T37) and freshman Lebow shot 81-81-84 (T72). 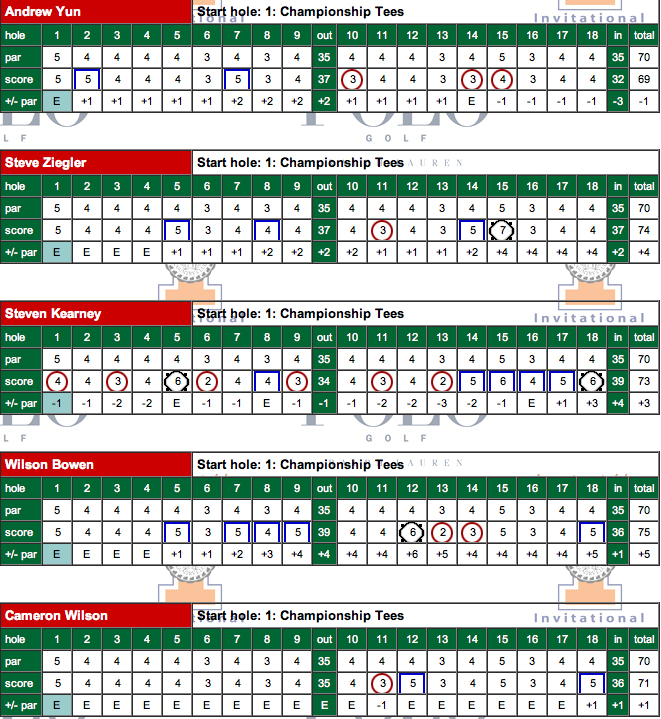 Complete scorecards for the third round are round below - click on the image to enlarge. Additional videos of the team playing holes at Isleworth can be found at this playlist - the videos can be located at the bottom of the screen and one video follows another automatically. Team qualifying has been completed for three spots to go to the Isleworth Collegiate Oct 24-26 near Orlando, Florida. Andrew Yun and Cameron Wilson are exempt from qualifying and will be traveling based on their strong play at the Prestige where they finished 1st and 5th respectively. There will be one coaches pick plus the two lowest qualifiers traveling. 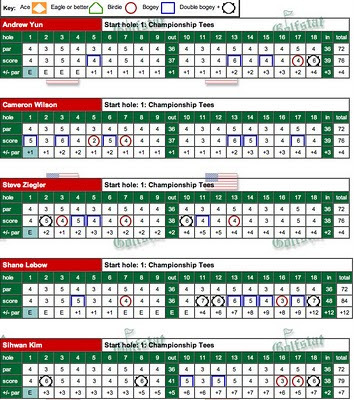 Based on the qualifying results below Steve Ziegler and Shane Lebow will be traveling and the coach's pick is senior Sihwan Kim. 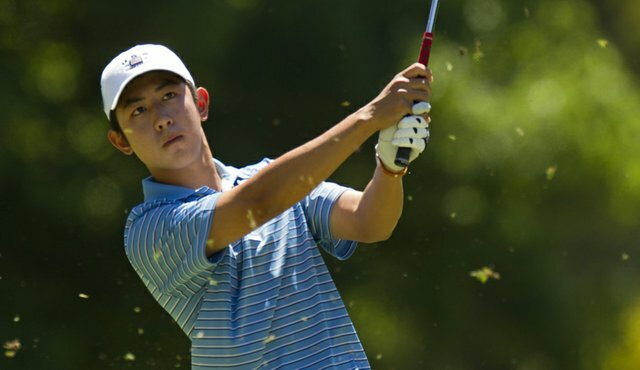 David Chung is not available as he is off to Buenos Aires, Argentina, to play as part of the US World Amateur team for the Eisenhower Trophy --- congrats to David. 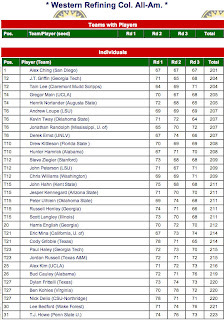 Stanford finishes 2nd at the Prestige tournament held in La Quinta at the PGA West Stadium Course. Sophomore Andrew Yun wins the individual event by 6 shots as he shot a brilliant 7-under, bogie-free, 65 final round, after opening rounds of 70-69. 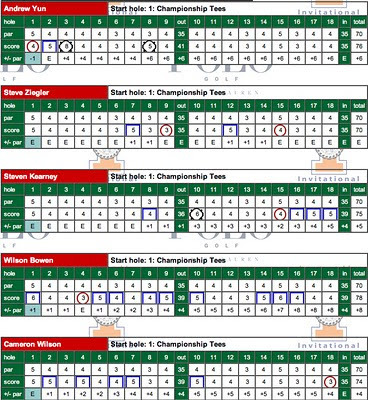 Finishing in 5th individually was freshman Cameron Wilson with rounds of 67-70-76, while Steve Ziegler had rounds of 79-74-74 to finish tied for 47th. 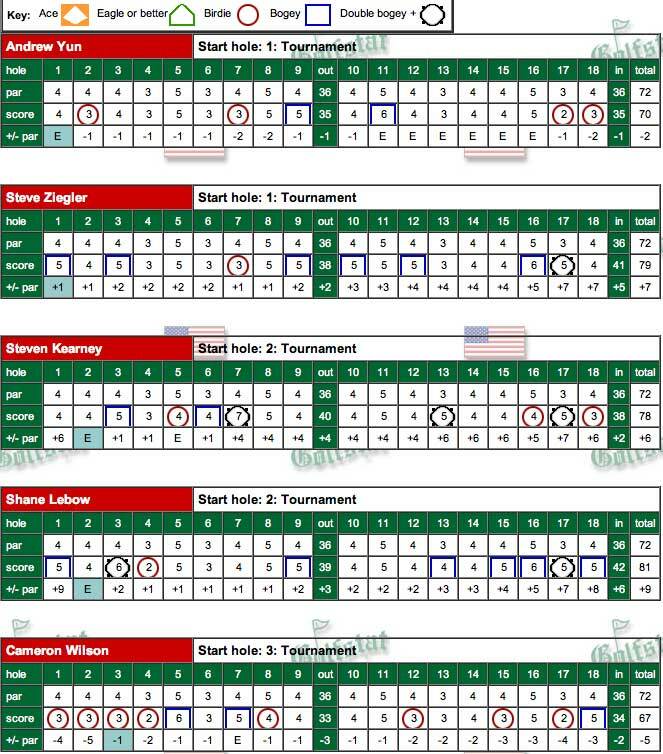 Freshman Shane Lebow had rounds of 81-68-77 to tie for 43rd and Steven Kearney finished tied for 67th with rounds of 78-76-80. Graham Brockington playing as an individual had rounds of 87-81-76 to tie for 77th. Congrats to Andrew for his great win, as well as to Cameron for his top 5 finish. 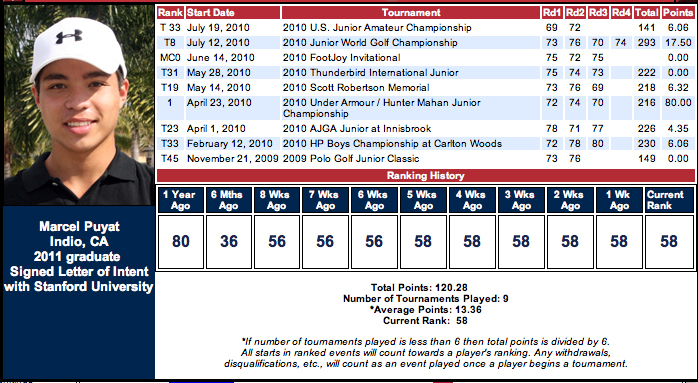 Complete scoring by GolfStat. 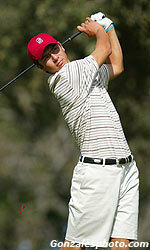 "It was neat to see Andrew Yun get first tourney win," Stanford coach Conrad Ray said. 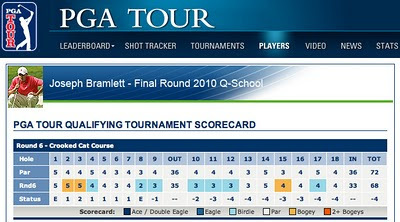 "He played a flawless final round with final round pins on the Stadium Course. Hats off to him." 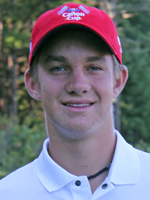 After the event Andrew was named national player of the week by Golf Week. As a team, the Cardinal finished in a tie for second after a final round of 4-over-par 292. 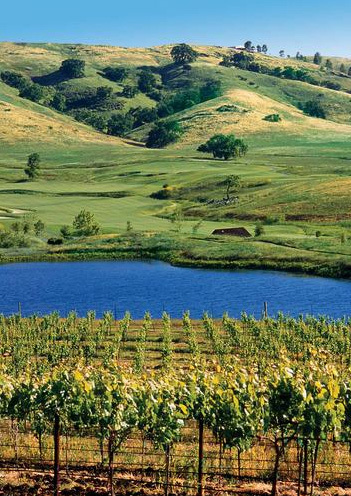 California took the team title with a three-day total of even-par 864. Stanford and Washington tied for second, three strokes back. "It was a good tournament for us all things considered," said Ray. "Everyone contributed and with two other freshmen in the lineup, tying for second is a nice week." 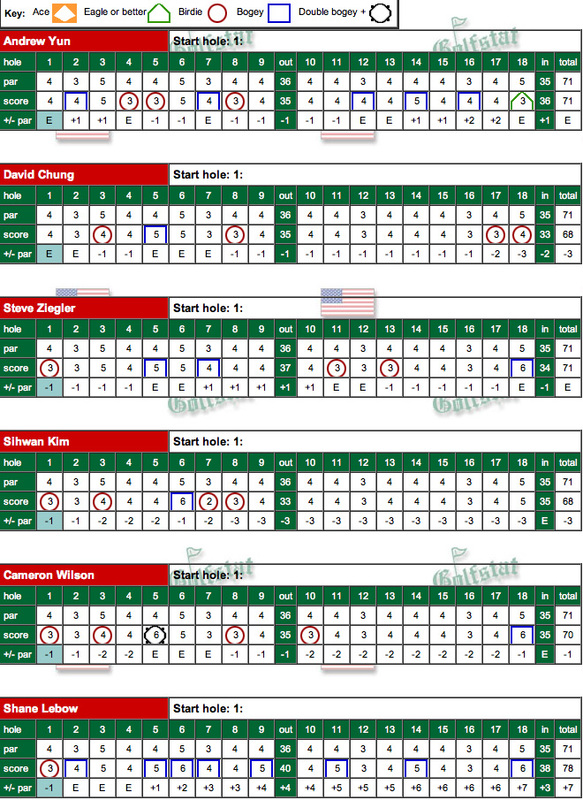 Yun played sensational golf all weekend, making 15 birdies and just three bogies on the PGA West Stadium Course. His final round was the best of the day as he separated himself from the rest of the field. 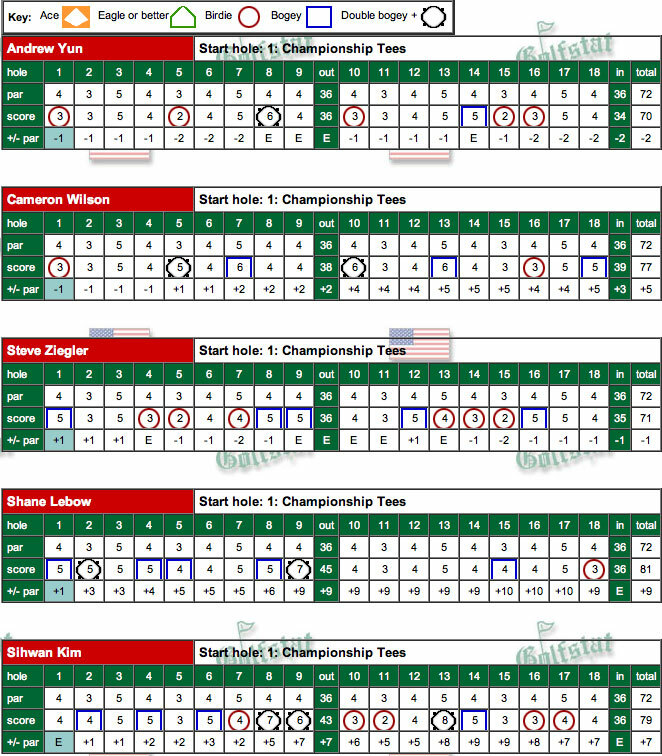 Final round scorecards for all team players can be found below -- click to enlarge. With the tournament's lowest round, Stanford climbed into a first place tie with Cal riding their young players to a 7-under 281 2nd round total. 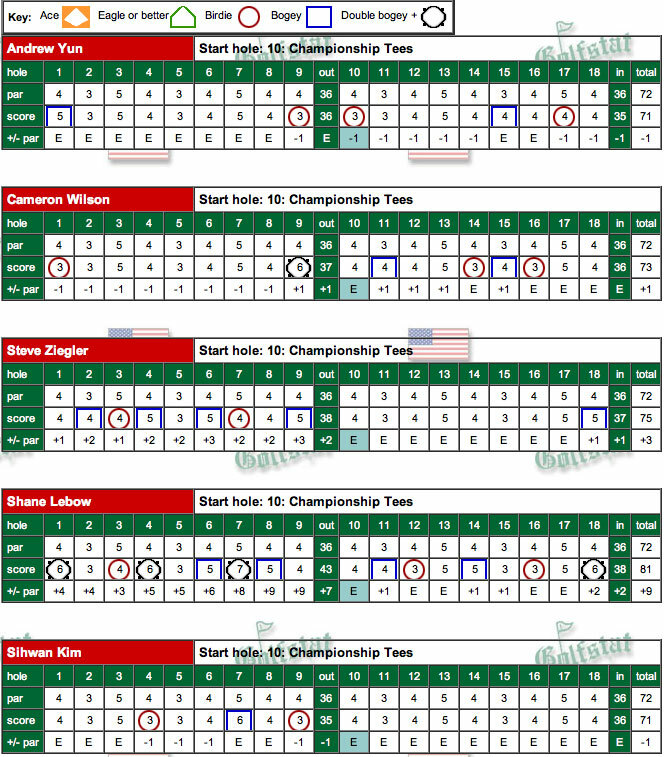 Freshman Shane Lebow rebounded with a 4-under 68 and fellow frosh Cameron Wilson had 70 (he's in 2nd individually with 67-70) and sophomore Andrew Yun is tied for 3rd overall with rounds of 70-69. 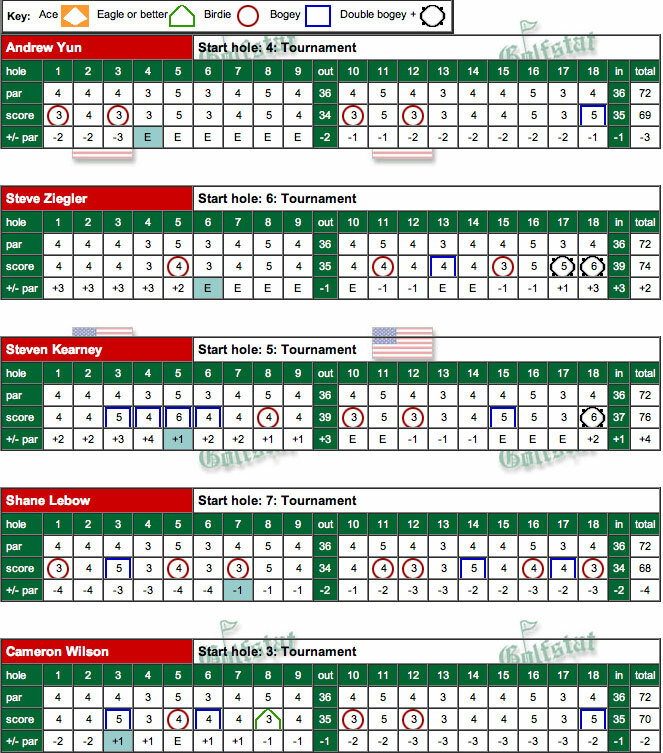 Senior Steve Ziegler birdied his last hole to shoot 74 and Steven Kearney had a 76. 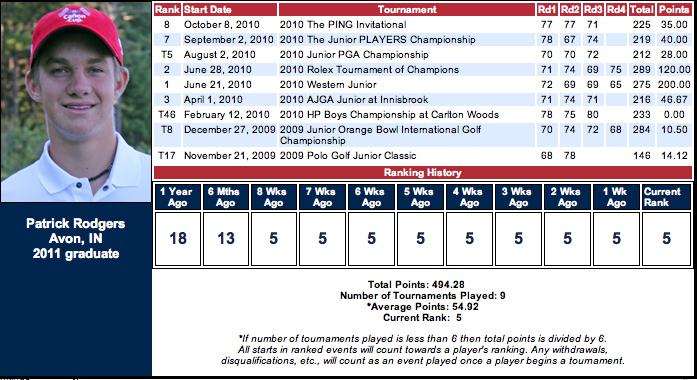 Complete scoring by GolfStat. 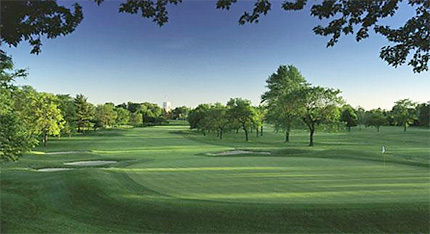 The afternoon round was played in near 100 degree weather with light winds. A 7:30 am start in the final round will cool off the field in a day when Stanford and Cal will go head-to-head. 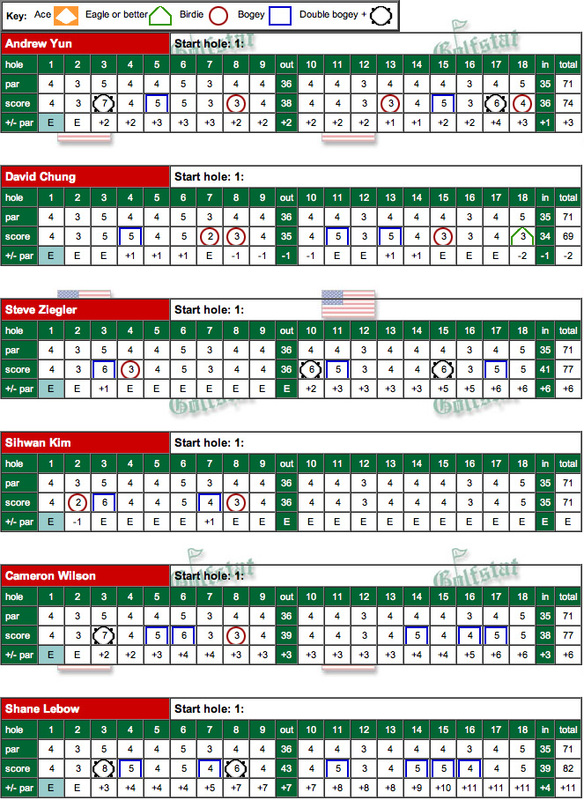 Totals are Wilson (67-70), Yun (70-69), Lebow (81-68), Ziegler (79-74) and Kearney (78-76). 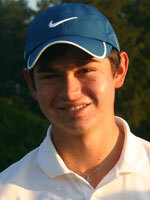 Playing as an individual, Graham Brockington had rounds of 87-81. 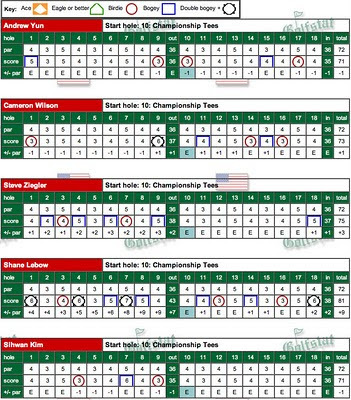 Second round scorecards for all team players can be found below --- click to enlarge. 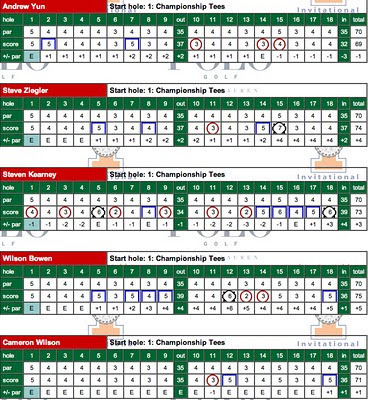 Freshman Cameron Wilson led the way in the first round as he was 1st individually with his 5-under 67 at the Prestige being played at famed the famed PGA West Stadium Course in La Quinta, CA. Stanford is tied for 3rd in this event which it's hosting with UC Davis. 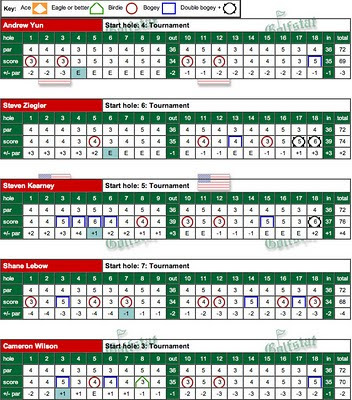 Other Stanford scores in the first round were Andrew Yun's 70, Steven Kearney's 78, Steve Ziegler's 79 and freshman Shane Lebow's 81. 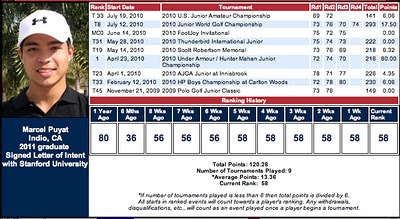 Complete scoring by GolfStat. 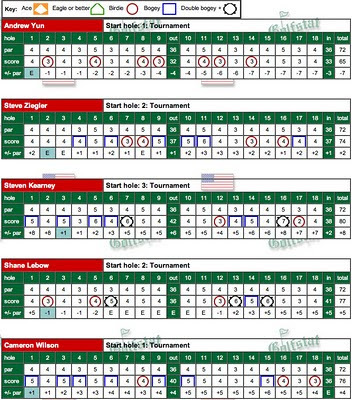 Cameron's round featured 8 birdies on the way to nines of 33 & 34 as can be seen below on his scorecard. Andrew's solid 2-under round included 4 birdies and two bogies. 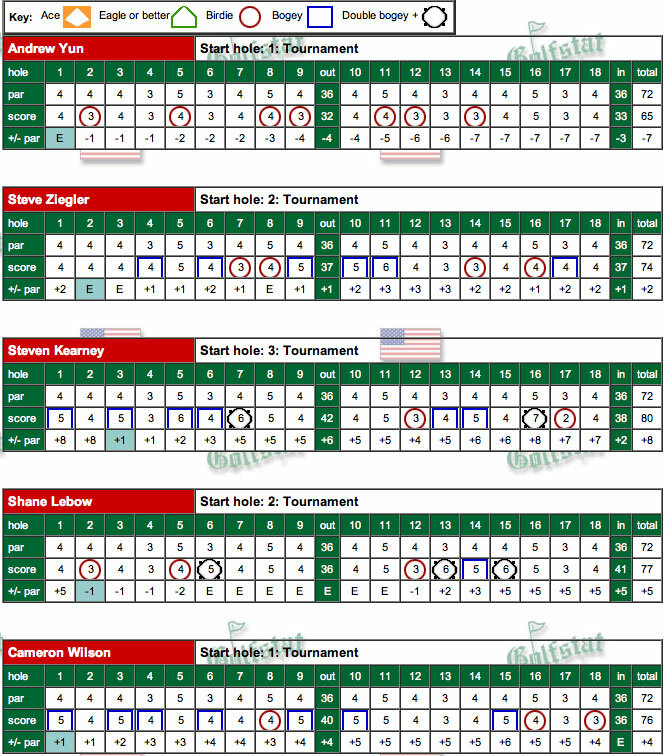 Steven's 78 included two double bogies and a triple bogies to offset his 3 birdies. 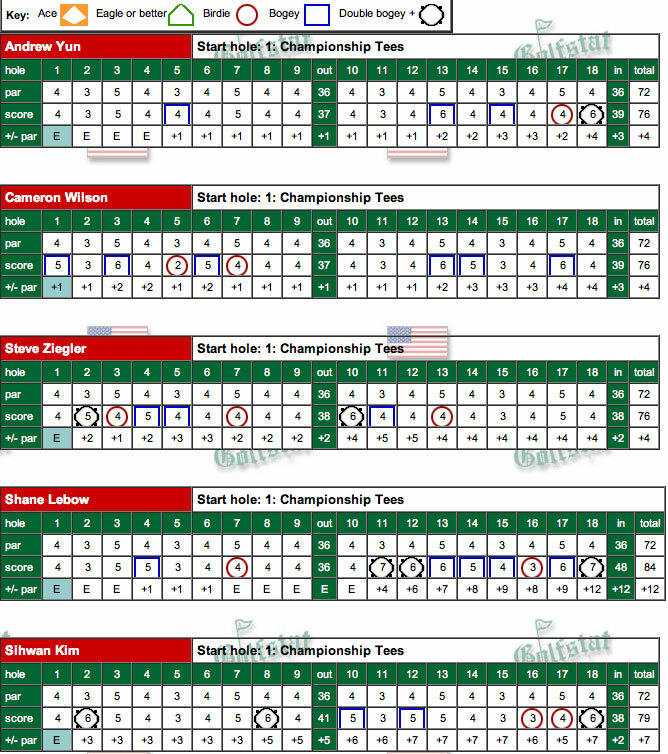 The back nine proved the undoing for both Steve Ziegler and Shane Lebow who shot 41 and 42 respectively. Missing from the team this week are Sihwan Kim who has been competing in the Asian Amateur in Japan and #1 player David Chung who is unavailable. Swing videos from a practice round are below. Below is a slide show from the practice round.